But what to do with the material that was leftover from the khaki pant surgery? The folks at Threadbanger came to my rescue. They make reconstructed ruched hats out of leftover pant legs. Awesome. My husband has had a pair of shorts down by my sewing machine all summer. The hem came out and I've been promising to learn how to fix it! The second video is crazy -- I'd love to make a hat like that, but her 8 minutes would take me a week! Yes, I think that hat far exceeds my sewing capabilities. I want to see your bermuda shorts and hat, though! This is a great idea. I thought about making some kid-sized aprons out of old pant legs . . . but I never got past the planning stage. One thing I should add about turning pants into shorts. Growing up my Mom did this a lot. Especially when I wore a hole in the kneee of a pair of pants/jeans that still fit in waist. Later in life, I found that cutting the legs of a pair of ugly Brady Bunch plaid thrift store pants can result in a much cuter pair of fun summer plaid shorts. What a great idea! 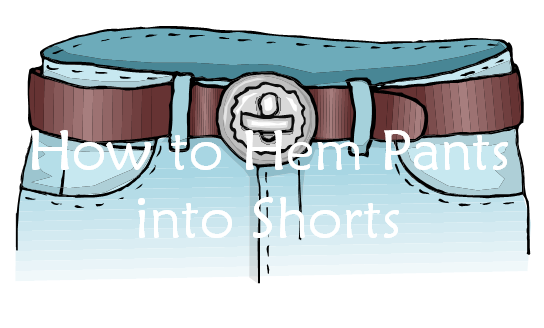 You can hem them to exactly the length that you want and know that they will fit you perfectly. It's time for me to go through my closet and see how many pairs of potential shorts are lurking there. Thanks so much for enriching our Thrifty Green Thursday!